Are you excited for Champion, the final book in Marie Lu’s Legend series? After the surprising cliffies in the last book, I know I am! The author has been teasing us mercilessly with cryptic tidbits for months, and while I’m a little worried about some of the things I’ve read, I also hear here will be “other things” just as swoon-worthy as Prodigy’s infamous bathtub scene. Be still my heart. Check out the action-packed trailer for the book below. It features some of the best special effects and production values I’ve ever seen, and now I’m totally ready for these movie adaptations to be made ASAP. Win a Champion Prize Pack! Champion is coming out next week on November 5th, and to celebrate, we’ve partnered with Penguin Teen to bring you a fun prize pack giveaway. — tattoos (of all three logos) so you can show off your Legend love! All you have to do is leave a comment below telling us what you like best about the Legend series and fill out the Rafflecopter form. Don’t forget that you can earn additional entries by sharing on Twitter, Facebook, too. I love all of Marie Lu’s characters. Not just June and Day (or their relationship. I totally ship them though) but all of her secondary characters too. And I actually already know part of what happens at the end of Champion, because I saw a spoiler on Goodreads! That is my fault though because I really shouldn’t read reviews beforehand. I was just too excited! I’m still really looking forward to it. I’ve heard it’s awesome! Jan recently posted…Location, location, location! My copy of Champion is coming in the post so it should arrive soon. I think ugly crying/sobbing/wailing is guaranteed whatever happens in the end. Legend was OK but I really loved Prodigy so I’m hoping Champion is just as good! I’m kind of nervous about the ending of this series actually. What if I don’t like the ending? Gah! I hope that doesn’t happen! I read Legend all the way back before it was released and LOVED it, but for some reason never managed to pick up Prodigy, but I SO want to continue this series. I love the characters and how tough they both are; Day can take care of himself, just like June can. I *love* that. I haven’t read this series yet, I’ve been waiting for the final book to be released. But thanks for reminding me to put all three on hold at the library. I’m looking forward to a good glom. I love this series. It does a great job with world-building and character development. It’s also fast-paced and action-packed, which keeps me on edge. Not to mention the swoon-worthy romance (god, that bathtub scene *sighs*). Prodigy was one of my favorite books this year, and I’ve been super excited about Champion since I finished it. I love how strong June and Day are; how they think for themselves and question what decision is best for everyone else (such as June’s decision regarding Anden). I’m just so excited to see what Day and June are up to! YES. What the heck is going to happen with Anden? I care more than I probably should. I love June and Day’s strength, too. But also, that they don’t feel the need to posture or throw their weight around, either. 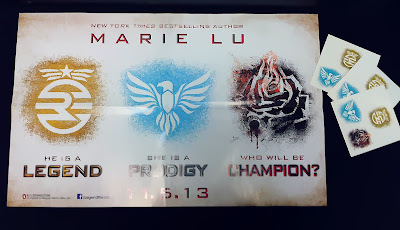 I’ve only just begun Prodigy but I can’t wait to read Champion! I love June and Day’s relationship and how they come from two different worlds. Hooray, you’ll be done just in time! :) I really like June and Day’s relationship, too–and I like them both separately as individuals. It’s nice that they both have their own story arcs. I cannot wait to get my hands on this book after that cliffhanger! but im nervous to find out what happens as well! I know! Not only the romantic cliffie, but what’s going on with Day, too. SO nervous. Ah! I totally forgot that Champion is being released this week. I haven’t even read Prodigy yet (maybe I’ll have a Legend-trilogy-reading weekend), but I loved that the world of Legend is so diverse. Bathtubs. *giggles* Cannot wait to get this one. I can’t help it, either! The new covers look great. Unfortunately this giveaway is US only but it’s cool .. I still have to read Prodigy. My friend keeps crying about the ending so I’m staying away till she gets the last book. Yeah, I think I still like the old covers better, but I like these, too. YES, read PRODIGY! Now that CHAMPION is almost out, there are no more excuses! Lucky you, that you don’t have to wait months to see how everything ends. Oh, I hope this ends happy, Wendy! *bites nails nervously* I was devastated at the end of Prodigy and I hope all can be fixed. With the ending of the last big trilogy (Divergent) you never know what these authors are going to do! 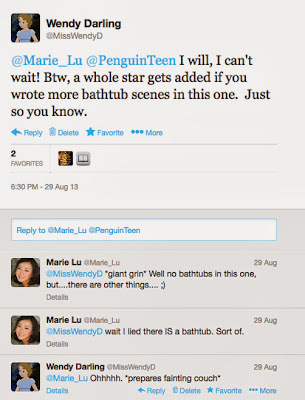 I hope Marie Lu isn’t so cruel. I DO, TOO! I know, I immediately thought of ALLEGIANT as I was reading that USA Today article, for some reason it didn’t occur to me that anything crazy would happen with this series, but you know, the tone of the books have been pretty serious. And hah, thanks for letting me know about Maggie! I searched through your site for a few minutes before I gave up. Silly me. Oh I”m curious about this series, I heard so many great things about it! thanks for the nice post. Oh, it’s a very fun series, Melliane–it’s action-packed, so I think an urban fantasy lover like you would enjoy it! Do check it out, Tanja! It’s a lot of fun, and I think PRODIGY is even better than LEGEND. Which bodes well for book three! 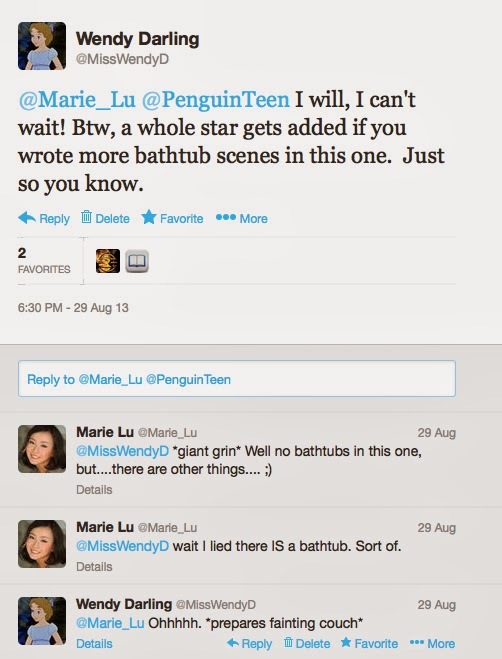 Really curious about this bathtub scene! I haven’t read the series yet but hopefully i can read it soon because I’ve heard pretty much nothing but positive things. I hope you enjoy the series when you get to it! I wasn’t expecting to like Legend as much as I did, I just pulled it off the library shelf because I really liked the cover. Something that I think is pretty unique about novel was the different coloured font. (Obviously not the only think that I liked, but I think it was an interesting formatting choice). You know, I have to admit that I liked, but didn’t entirely love the first book, but everything developed really nicely in the sequel, so a I ended up really enjoying it. I don’t always love the colored fonts thing either, but I really liked the way they are used in this series! Curious what color we’ll get for CHAMPION. I’m thinking maybe red. The cover has a lot of red in it. Also, it is kind of ominous. Ooh I’m so excited for Champion! My only dilemma is what format to buy. I listened to Prodigy on audio, but I have the books too. Decisions, decisions. I like the setting in the Legend series, with the familiar LA landmarks (in ruins) and the fast-pace. I hope there is a satisfying ending!! Oh, that’s a hard one–I’ve enjoyed the different colored inks in the last couple of books, so I’m curious what the text will look like in CHAMPION! I think I’d miss that if I listened to it, although with different POVs, a narrator might be really enjoyable, too. Oh, and PS–that USA Today interview worries me! I was sort of sure I knew what was going to happen, and now I am sure of nothing. I haven’t read the USA Today interview! I wanted to go in fresh, but I’m scared now. Especially after Allegiant- not sure I can take it! Legend is one of my all-time favorite series. I love that there is a balance between romane and action. YES! They’re fun, action-packed, and swoon-worthy all at once. I just love the dystopian feel of it and the characters are all unique. I really like her characterizations, especially in this last book! June has grown quite a bit, and it’s been interesting to get to know some of the secondary characters, too. I love that in this series there is no surprise that our hero and heroine are the best. Some YA ‘springs’ it on you, you’re following someone ordinary and then all of a sudden, they are special. In this series, there is no apology. I love that. That’s such a good point–her characters own their power and that’s really refreshing. This actually makes them more like adult characters, too; even though they’re still coming of age stories, it’s not the typical “origin” type stories.